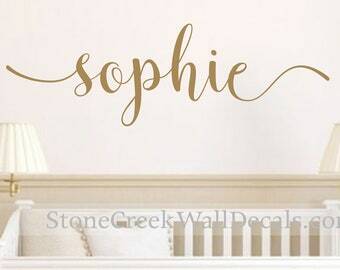 Announcement Welcome to Stone Creek Wall Decals! 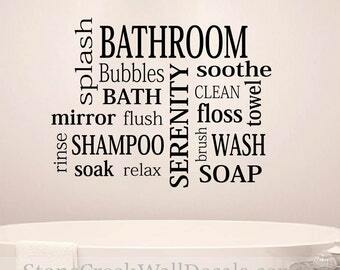 We are proud to offer The Best Decals for DIY Home Decor. We offer one of a kind designs, fast shipping and friendly customer service. Our vinyl decals are top quality and intended for home decor, making the decals easily removable when you are ready for a change. We have over 40 beautiful colors to choose from. 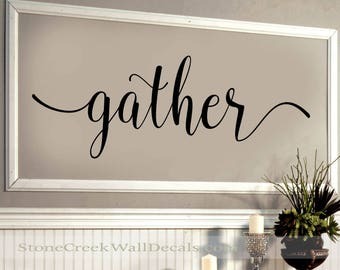 Our wall decals are made in the USA with the highest quality, matte-finish vinyl manufactured specifically for home decor. Your decal will look hand painted once applied. Our decals will adhere to almost any smooth surface including walls, windows, mirrors, floors, cabinets, laptops, and more! The decals will adhere to slightly textured walls. 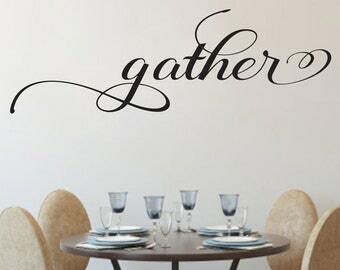 Our wall decals can be easily removed without damage to your surface or paint and will not leave any adhesive residue. While the decals are removable, they are not re-usable. We offer FREE First Class Shipping in the USA for most of our products, with the option to upgrade to Priority Shipping (2-3 days) at checkout! We also offer first class shipping to Canada, Ireland, the UK and Australia. CUSTOMS FEES: We are obligated to mark all items as merchandise. International shipments may be charged import fees/handling fees. The shipping charge paid to Stone Creek Wall Decals ONLY covers my actual cost to ship the package to your country. CUSTOMERS are responsible for ALL additional import,customs and handing fees assessed by their country and are advised to research the costs prior to shipment/Purchase. Need help with application, removing and other decal questions? Please view some videos on our YouTube Channel. If your paint can says VOC free anywhere on the can, You may have problems getting the decals to stick to the painted surface. Whether you have used, matte, Satin, Semi-gloss or Glossy Paint, it's the VOC that will pose the issue of allowing your decal to stick properly. Yolo Colorhouse, Behr Premium Plus Enamel Low Luster, Benjamin Moore’s Natura® paint, and Glidden Spred®. Sherwin Williams offers several such paints including GreenGuard Emerald Interior Acrylic Latex, Harmony, Pro Industrial Zero VOC Waterborne Catalyzed Epoxy, Pro Industrial Zero VOC Acrylic Coating, and ProMAR 200 & 400 Interior Latex paint. 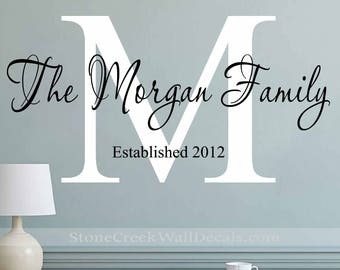 Welcome to Stone Creek Wall Decals! 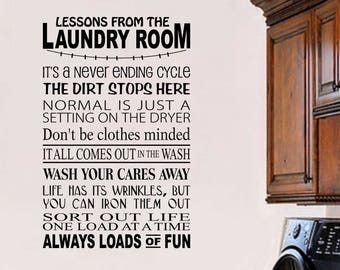 We are proud to offer The Best Decals for DIY Home Decor. We offer one of a kind designs, fast shipping and friendly customer service. Our vinyl decals are top quality and intended for home decor, making the decals easily removable when you are ready for a change. 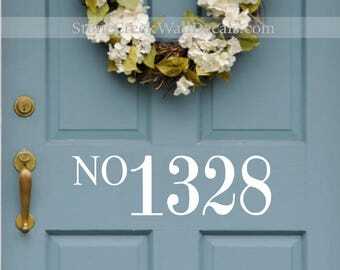 Beautiful product and looks great on our front door! So easy to apply and the shop owners worked with me to get a size that fit my space. Thank you! this came extremely fast and looks great!! ★★★★★ "Love the decal! Very easy to apply, excellent quality! Love how it came out " Jade C.
Love how such a simple decal can put the finishing touch on this gorgeous guest room. I’ve been putting off creating chore charts for my kiddos for what seems like forever. However, this photo I received from a customer makes me want to put those charts at the top of my to do list. Don’t these look amazing?! Over 10,000 satisfied customers! 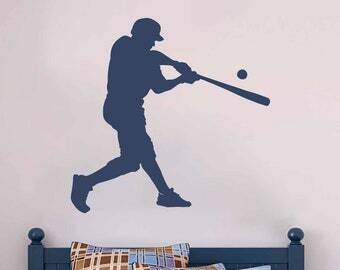 High quality wall decals! We're a family owned shop here in the USA. We started our business as a way to earn extra money to cover infertility treatments. Over the past 12 years, it's not only helped us build our family, but has become something we LOVE. We feel so blessed for such amazing customers and are ever grateful for continued support from YOU. All decals are cut to order in my in-home work studio (pet & smoke free). Every aspect of your order, starting from the design itself, to the packaging and mailing, is handled by me or my family. You can shop with the confidence that you are supporting a truly handmade business! I'm Miranda, a stay at home mom to two awesome kids and wife to an amazing husband. I love movies, sports, outdoors and my family! Thank you for stopping by! We look forward to working with you! 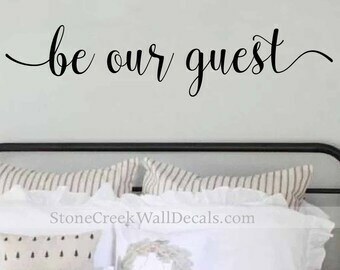 Welcome to Stone Creek Wall Decals on Etsy! We're excited you stopped by. 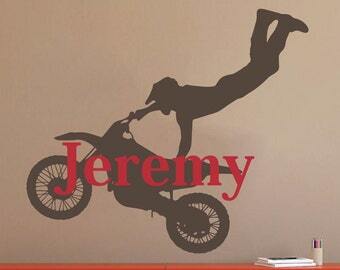 Feel free to browse our shop for your favorite vinyl wall decals. If you aren't able to find exactly what you're looking for, let us know and we'll be happy to create a custom design just for you. 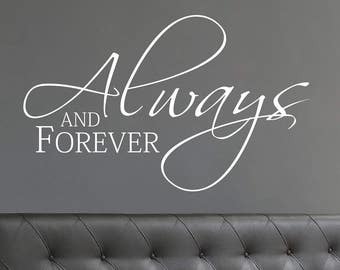 At Stone Creek Wall Decals, we are committed to our customers and hope you love your decals as much as we do! Due to the customized and made to order nature of our products, we are not able to accept returns or exchanges. 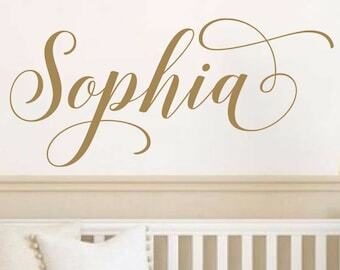 (Initials, names, sizes, colors, and fonts selected are all customizations that make your order especially for you!) We hold no stock. All orders are custom cut after order is placed. We cannot accept cancellation requests once production of an order has started. Please make sure you review the sizes before you place your order. *If when the product arrives and it is defective in any way or you were sent the wrong item, size, or color, we will replace it with the same design and color choices free of charge. 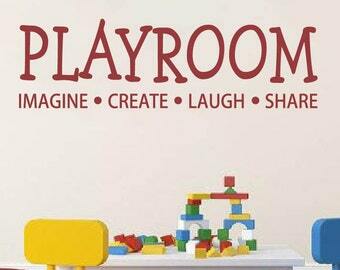 We accept payment through PayPal or Direct checkout. We will start processing your order as soon as payment has cleared and details of orders are finalized. Please write details of orders in the message to seller box at checkout. If no colors are indicated the default colors of the main image you purchased will be mailed. We try to ship all of our orders within 48 hours. If for some reason the order will take longer than the normal 48 hours from payment, we will contact you to inform you of the delay. Processing time does not include ship time. If you need your order by a specific date please contact me PRIOR to placing your order to make sure that I am able to meet the deadline. SHIPPED WITHIN THE UNITED STATES: Orders are shipped First Class via USPS if they are under 9" x 12" in size. For sizes larger than 9" x 12", allow 3-5 business days for delivery via USPS Priority Mail. INTERNATIONAL ORDERS: Orders will be shipped First Class Mail International and will take approx 2 weeks to arrive. Prices vary depending on weight and size. Items will not be reshipped until 30 days AFTER item was originally shipped. We are not responsible for delays when postal companies are on strike. **Guaranteed dates are for shipping date only, NOT guarantee of delivery. 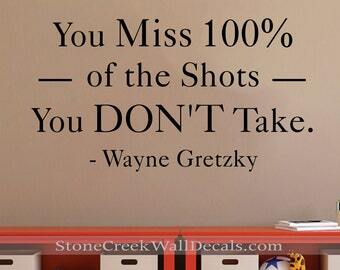 Once item is accepted into USPS system Stone Creek Wall Decals is NO LONGER liable for date of delivery. 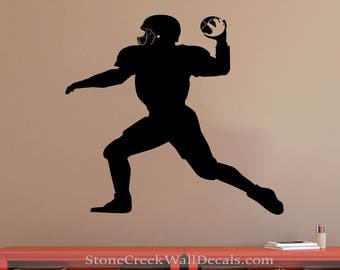 Stone Creek Wall Decals is not responsible for labor, installation, incidental or consequential damages of any kind. Customer assumes all risk and liability associated with the use of our products. PLEASE BE ADVISED: Vinyl Lettering can be applied to most non-porous smooth or semi-smooth surfaces. It works best on semi-gloss, gloss enamel, and flat enamel painted walls that have been allowed to cure/gas out/dry for at least 3 weeks. If possible, avoid matte finish latex paints and paints that contain anti-graffiti agents or stain blockers. 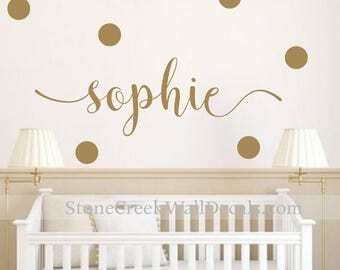 Vinyl wall decals may NOT adhere to painted surfaces with Teflon, stain guard or Zero VOC Low Odor paints that have been used (a green friendly paint). If your paint can says VOC free anywhere on the can, you may have problems getting the decals to stick to the painted surface. Whether you have used, matte, Satin, Semi-gloss or Glossy Paint, it's the VOC that will pose the issue of allowing your decal to stick properly. Where do I leave my name or monogram? 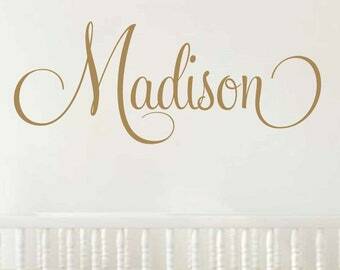 What order do I list my monogram in? 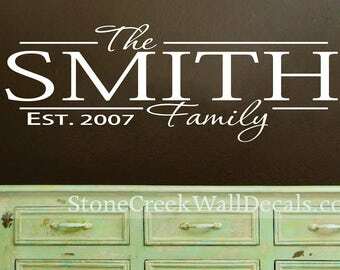 All personalization info is to be left in the "Notes to Stone Creek Wall Decals" box that comes up at checkout. This is where you list desired initials, names and monograms. Please be sure to leave your monogram in the EXACT order you want it to read from left to right. If you want yours to read HGF, then you need to type in HGF at checkout! However, not everyone adheres to this typical order/arrangement, so it is imperative that you list yours in the EXACT order you want it to read from left to right. We only send proofs upon request. Proofing is very time consuming and in order to keep our super fast turnaround time and get you your order asap, we don't offer proofs as a standard practice. 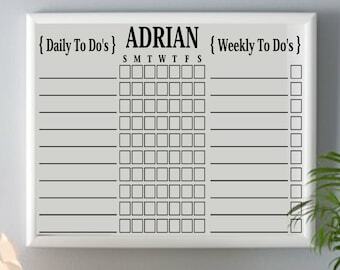 However, we will send one if you request one. Be aware that if you prefer a proof, production of your order will not be able to start until proofs are approved. Please be sure that you are signed up to receive convos and notifications through the convo system here on etsy to keep this seamless and so as not to halt production/processing of orders. My order shipped several days ago and it's not here yet. Can you tell me where it is? All orders are are mailed via the USPS. You will receive an email notification once your package has shipped, and it will contain your tracking number. You can check the status of your order at any time with this number. Unfortunately, tracking is not always accurate and there can be delays in scanning/tracking. We've seen domestic orders take 2 full weeks to deliver, though this is rare, thankfully. For this reason, we will not send replacements or consider a package "lost" until ten full business days have passed since shipping. Business days are Mon-Fri, and do not include weekends or holidays. Our vinyl decals will adhere to almost any smooth surface including walls, windows, glass, mirrors, finished woods, laptops, plastics, tiles, and more! The decals will adhere to slightly textured walls. 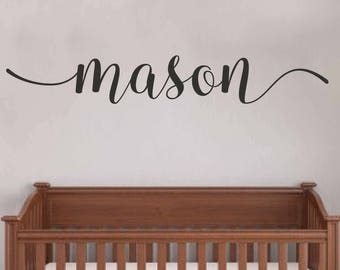 ** Important note: Interior grade vinyl decals have been found to have lower adhesion levels with some types of VOC free paints and/or paints containing stain blockers. If you are worried you have this type of paint, we advise trying out a test decal before purchasing a decal. Refunds will NOT be issued for decals not sticking due to this type of paint. What type of decals do you offer? What brand of vinyl do you use? Our decals are die-cut, meaning the designs/letters are cut out of solid color rolls of vinyl. They contain NO background or clear outline around them. They are applied with a sheet of transfer tape that is later removed. Die-cut decals are very different than printed decals where inks are used on a clear background. We use Oracal brand vinyl for our decals. We also use the Oratape transfer tape that is specifically designed to work with Oracal brand vinyl. These are the highest quality materials in the industry.